Should we worry about eating fish irradiated by Fukushima? Summary: There are many scary stories circulating about the effects of the radiation released into the Pacific by the explosions at Fukushima, contamination now flowing towards us. Today we review the evidence, so you can decide for yourself. But Fukushima still leaks, and there are good grounds to worry about a massive radiation release in the future. The radioactive groundwater leaks could still become worse in the future if TEPCO does not contain the problem, U.S. scientists say. But they cautioned against drawing firm conclusions about the latest impacts on ocean life until new peer-reviewed studies come out. … The overall contamination of ocean life by the Fukushima meltdown still remains very low compared with the effects of naturally occurring radioactivity and leftover contamination from U.S. and Soviet nuclear weapons testing in the 1960s. Fisher said he’d be “shocked” if the ongoing leaks of contaminated water had a significant impact on the ocean ecosystems. Ocean simulations showed that the plume of radioactive cesium-137 released by the Fukushima disaster in 2011 could begin flowing into U.S. coastal waters starting in early 2014 and peak in 2016. Luckily, two ocean currents off the eastern coast of Japan — the Kuroshio Current and the Kuroshio Extension — would have diluted the radioactive material so that its concentration fell well below the World Health Organization’s safety levels within four months of the Fukushima incident. Scientists have been and are closely studying the radiation released by Fukushima, as seen in the following research. So far there appears to be little reason for concern. Radioactive isotopes originating from the damaged Fukushima nuclear reactor in Japan following the earthquake and tsunami in March 2011 were found in resident marine animals and in migratory Pacific bluefin tuna (PBFT). Publication of this information resulted in a worldwide response that caused public anxiety and concern, although PBFT captured off California in August 2011 contained activity concentrations below those from naturally occurring radionuclides. To link the radioactivity to possible health impairments, we calculated doses, attributable to the Fukushima-derived and the naturally occurring radionuclides, to both the marine biota and human fish consumers. that Fukushima-derived doses were 3 to 4 orders of magnitude below 210Po-derived doses. Doses to marine biota were about 2 orders of magnitude below the lowest benchmark protection level proposed for ecosystems (10 µGy⋅h−1). The additional dose from Fukushima radionuclides to humans consuming tainted PBFT in the US was calculated to be 0.9 and 4.7 µSv for average consumers and subsistence fishermen, respectively. Such doses are comparable to, or less than, the dose all humans routinely obtain from naturally occurring radionuclides in many food items, medical treatments, air travel, or other background sources. Although uncertainties remain regarding the assessment of cancer risk at low doses of ionizing radiation to humans, the dose received from PBFT consumption by subsistence fishermen can be estimated to result in two additional fatal cancer cases per 10,000,000 similarly exposed people. A sequence of global ocean circulation models, with horizontal mesh sizes of 0.5°, 0.25° and 0.1°, are used to estimate the long-term dispersion by ocean currents and mesoscale eddies of a slowly decaying tracer (half-life of 30 years, comparable to that of 137Cs) from the local waters off the Fukushima Dai-ichi Nuclear Power Plants. The tracer was continuously injected into the coastal waters over some weeks; its subsequent spreading and dilution in the Pacific Ocean was then simulated for 10 years. The simulations do not include any data assimilation, and thus, do not account for the actual state of the local ocean currents during the release of highly contaminated water from the damaged plants in March–April 2011. An ensemble differing in initial current distributions illustrates their importance for the tracer patterns evolving during the first months, but suggests a minor relevance for the large-scale tracer distributions after 2–3 years. By then the tracer cloud has penetrated to depths of more than 400 m, spanning the western and central North Pacific between 25°N and 55°N, leading to a rapid dilution of concentrations. … Tentatively assuming a value of 10 PBq for the net 137Cs input during the first weeks after the Fukushima incident, the simulation suggests a rapid dilution of peak radioactivity values to about 10 Bq m−3 during the first two years, followed by a gradual decline to 1–2 Bq m−3 over the next 4–7 years. The total peak radioactivity levels would then still be about twice the pre-Fukushima values. High concentrations of several radionuclides were reported in the sea near the Fukushima Daiichi Nuclear Power Station (FDNPS) in Japan due to the nuclear accident that occurred on 11 March 2011. The main source of these concentrations was leakage of highly radioactive liquid effluent from a pit in the turbine building near the intake canal of Unit-2 of FDNPS through a crack in the concrete wall. In the immediate vicinity of the plant, seawater concentrations reached 68 MBq m−3 for 134Cs and 137Cs, and exceeded 100 MBq m−3 for 131I in early April 2011. These concentrations began to fall as of 11 April 2011 and, at the end of April, had reached a value close to 0.1 MBq m−3 for 137Cs. … In this study, the measured concentrations of different radionuclides near the south discharge canal of the FDNPS were used to estimate their leakages into the Pacific Ocean. The method is based on estimating the release rates that reproduce the concentration of radionuclides in seawater at a chosen location using a two-dimensional advection–dispersion model in an iterative manner. The radioactive leakages were estimated as 5.68 PBq for 131I, 2.24 PBq for 134Cs and 2.25 PBq for 137Cs. Leakages were also estimated for 99mTc, 136Cs, 140Ba and 140La and they range between 0.02 PBq (99mTc) and 0.53 PBq (140Ba). It was estimated that about 11.28 PBq of radioactivity in total was leaked into the Pacific Ocean from the damaged FDNPS. Out of this, 131I constitutes 50.3 %; 134Cs 20 %; 137Cs 20 %; 140Ba 4.6 %; 136Cs 2.6 %; 140La 2.3 % and 99mTc 0.2 % of the total radioactive leakage. Such quantitative estimates of radioactive leakages are essential prerequisites for short-term and local-scale as well as long-term and large-scale radiological impact assessment of the nuclear accident. We present an initial characterization of the input of 129I into the Pacific Ocean resulting from the 2011 Fukushima nuclear accident. This characterization is based primarily on 129I measurements on samples collected from a research cruise conducted in waters off the eastern coast of Japan in June 2011. These measurements were compared with samples intended to reflect pre-Fukushima background that were collected during a May 2011 transect of the Pacific by a commercial container vessel. In surface waters, we observed peak 129I concentrations of ~300 μBq/m3 which represents an elevation of nearly three orders of magnitude compared to pre-Fukushima backgrounds. We coupled our 129I results with 137Cs measurements from the same cruise and derived an average 129I/137Cs activity ratio of 0.442 × 10−6 for the effluent from Fukushima. Finally, we present 129I depth profiles from five stations from this cruise which form the basis for future studies of ocean transport and mixing process as well as estimations of the total budget of 129I released into the Pacific. Based on the statistics of all surface drifting buoys of 1978–2011 and Lagrangian tracers simulated from high quality ocean reanalysis currents, the impact times and strength of Fukushima nuclear pollution to the east coast of China and the west coast of America have been estimated. … starting from 1% at 1.5-year, of the initial level at the originating area of Fukushima nuclear pollution, the impact strength of Cesium-137 in the South China Sea continuously increases up to 3% by 4 years, while the impact strength of Cesium-137 in the west coast of America is as high as 4% due to the role of strong Kuroshio-extension currents as a major transport mechanism of nuclear pollutants for that area. Following the March 2011 Fukushima disaster, large amounts of water contaminated with radionuclides, including Cesium-137, were released into the Pacific Ocean. With a half-life of 30.1 years, Cs-137 has the potential to travel large distances within the ocean. Using an ensemble of regional eddy-resolving simulations, this study investigates the long-term ventilation pathways of the leaked Cs-137 in the North Pacific Ocean. The simulations suggest that the contaminated plume would have been rapidly diluted below 10,000 Bq/m3 by the energetic Kuroshio Current and Kurushio Extension by July 2011. Based on our source function of 22 Bq/m3, which sits at the upper range of the published estimates, waters with Cs-137 concentrations >10 Bq/m3 are projected to reach the northwestern American coast and the Hawaiian archipelago by early 2014. Driven by quasi-zonal oceanic jets, shelf waters north of 45°N experience Cs-137 levels of 10–30 Bq/m3 between 2014 and 2020, while the Californian coast is projected to see lower concentrations (10–20 Bq/m3) slightly later (2016–2025). This late but prolonged exposure is related to subsurface pathways of mode waters, where Cs-137 is subducted toward the subtropics before being upwelled from deeper sources along the southern Californian coast. … The sensitivity of our results to uncertainties in the source function and to inter-annual to multi-decadal variability is discussed. Almost all of these studies work off of the March 11, 2011 ***incident*** , and do not reflect the assumptions now apparent in late July’s “revelations” of ongoing groundwater flowing around the destroyed reactors, becoming contaminated, and being hydrologically connected with the sea from this oceanfront plant. The aboveground storage tank leaks, bad as they are, are a distraction from the groundwater problem; and not only its release to the sea, but its contribution to the volume necessary to pump and treat – a volume that is quickly going to overwhelm the tank farm. Yes, debris reaching the US in 2013 and 2014 is from the initial March 2011 release. The leaks that accellerated starting in Spring 2013 could add up to a substantial 2nd wave of radiation. And, as desribed in my two previous posts about Fukushima, there could be a massive release if one of the containment systems fail. Nice summary, thanks for putting this together! Nice snapshot of the current situation. 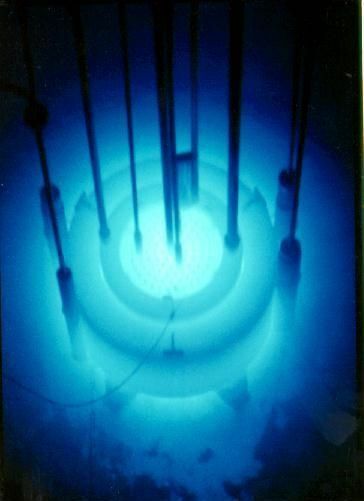 All will change if a criticality event happens during fuel-rod removal at Unit 4 this fall. Look on the upside. 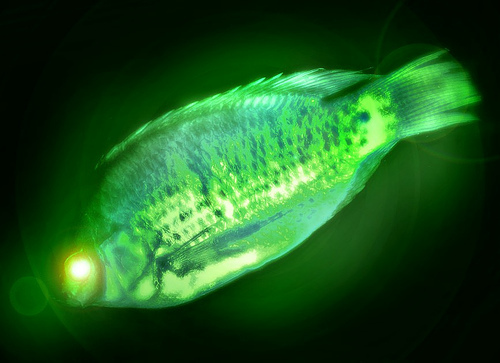 Eating those fish will give you a healthy glow. We have a clear winner for Best of Thread, with bonus accolades for double dark humor. What do you think of the EPA massively increasing it’s “safe radiation limits” accross the board in the US ? Strange behaviour from an organisation ostensibly supposed to protect the public health – another manifestation of national madness ? We use a Creative Commons license, appearing in the right-side menu. Thanks for that comment. I didn’t know that.